CHARLOTTE, NC. 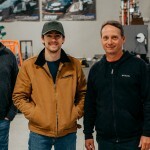 – April 12, 2019 – The Ryan Blaney Family Foundation, which is headed by rising NASCAR star Ryan Blaney, has commissioned Gateway Bronco to build a one-of-a-kind 1974 Ford Bronco that will be sold at Barrett-Jackson’s 2020 Scottsdale Auction to support the Alzheimer’s Association. Based on an entirely new body, the reimagined classic Bronco includes a contemporary Ford drivetrain, updated suspension, custom interior and heritage styling. At 25-years-old, Ryan Blaney is a key pillar of NASCAR’s youth movement and an important part of Team Penske’s championship-winning NASCAR program. In 2018, Blaney had a strong season including a victory at the inaugural ROVAL 400 at Charlotte Motor Speedway. Blaney finished 10th in the standings with career bests in top-five finishes, top-10 results, poles and laps led. Brimming with enthusiasm, passion and talent, 2019 marks Blaney’s eighth season with Team Penske and his second season racing full-time for them. Blaney returns to the No. 12 team driving a Ford Mustang in the NASCAR Cup Series. Blaney is so focused on raising awareness around and generating research funding for Alzheimer’s because his grandfather, Lou Blaney, passed away from Alzheimer’s in 2009. Lou Blaney is a Hall of Fame dirt track racing legend with over 600 wins and was the person who started the Blaney family inracing. A long-time Ford Bronco fan, Blaney currently owns a 1985 model. He has spent a great deal of time working with the Gateway Bronco team to spec out his vision of the ultimate classic SUV. The vehicle will be built in Gateway Bronco’s state-of-the-art 60,000 square foot manufacturing center and come with an industry leading 5-year bumper-to-bumper warranty. One of the largest restorers of the first- generation Bronco, Gateway can produce between two and four vehicles a month and meets the Certified Reconditioned Vehicle standards established by Ford. For more information, visit www.gatewaybronco.comand follow them on Facebook at Gateway Bronco.